For getting leaves, dirt & heavy sludge out of the gutter quickly and safely. In New Zealand, relatively few gutters are as accessible as the one pictured here. Almost everyone we surveyed told us about the cuts and lacerations they usually suffer when trying to clean the gutter. The gutter spade has a non-scratching nylon blade that fits all traditional gutter profiles. By offsetting the blade we have produced a tool that cleans where other tools simply cannot reach. Seeing the spade stem is constantly coming into contact with sharp, abrasive roofing edges we have incorporated a long-reach, zinc plated, solid steel shaft. 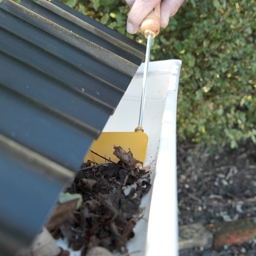 The gutter spade enables you to clean gutters, quicker, easier and safer than ever before! For best results, and to prevent blocked up downpipes, we recommend you don`t introduce the hose until after you have cleared out the guttters with your gutter spade.